Having adapted the nu metal and rap metal genres to a radio-friendly yet densely layered style in Hybrid Theory and Meteora, the band explored other genres in their next studio album, Minutes to Midnight, which was released in 2007. The album topped the Billboard charts and had the third best debut week of any album that year. The band has collaborated with several other artists, most notably with rapper Jay-Z in their mashup EP Collision Course, and many others included on Reanimation. 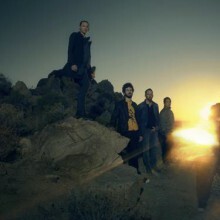 The band's most recent studio album, A Thousand Suns, was released on September 8, 2010. Linkin Park has sold over 50 million albums worldwide and has won two Grammy Awards. Mike Shinoda - vocals, rhythm guitar, keyboard (since 1996). Scott Koziol - bass (2000-2001). 4. A Thousand Suns (2010). Darling readers if you are reading this, you clicked on the page of the singer linkin park in our eLyricsWorld. Our database has disposal of data about 52389 artists throughout the world as well as 829824 songs 554 of which are from linkin park. Except for the the biography of the singer, on this page you can see brief information about them, covers date of birth, style, label Be informed all the events around linkin park by adding RSS link. If you prefer you could directly visit the address you are on right now and see the latest songs about the artist.